Take those ripe bananas and turn them into breakfast! This baked oatmeal takes the flavors of banana bread and bakes them into oatmeal goodness. Good morning, everyone! I made you some oatmeal to start your day off on the right foot. Today I am writing on the prompt mom's favorite recipe. I know it seems a bit odd to choose oatmeal for that prompt, but the funny thing is it is my baked oatmeal recipes that MiMi makes most from the blog. On weekend mornings, my parents and younger brother have a routine. MiMi gets up early and works out. Then while she is getting ready, my youngest brother comes to their house to work out. He works out at the gym during the week, so I am not sure how this got started, but it is what it is. Then they all have breakfast together and go about the business of the day. They are all watching what they eat (most of the time, anyway) so breakfast is usually something relatively healthy. And quite frequently I get a text from MiMi telling me which version of baked oatmeal she is making. She made baked oatmeal before the blog, but she really enjoys the texture of the baked oatmeal I make. A lot of baked oatmeal is dense, but mine is thicker, softer and healthier than a lot of the other recipes she has tried. They loved the strawberry cheesecake version when they had that, hot cocoa version is one of my favorites and I can't wait for fall to come around so we can make more pumpkin pie baked oatmeal. There are so many great options!! MiMi and I both tend to always have a lot of bananas on hand which means every so often we both end up with overripe bananas. I know she loves my maple banana baked oatmeal, but I thought it would be fun to switch it up a bit so she would have more options. So, I went to work to make her a new oatmeal recipe to try! The result was delicious. It has the spices I love in my banana bread and the texture I love in my oatmeal. I was REALLY tempted to stir in some chocolate chips as they are a favorite addition in banana bread, but I chose to leave them out in honor of mom and trying to keep it lighter. You should totally throw some in though, after all a little chocolate is good for you too! The best part (other than how easy it is to make) is baked oatmeal stores and reheats well. So, you can make a batch on the weekend and eat it throughout the week. A lot of people I know love to warm the oatmeal and then pour milk over it and eat it. We tend to eat ours plain or with a little yogurt on top. Maybe a drizzle of maple syrup or honey if we are treating ourselves. Really anything goes! Preheat your oven to 350 F and great a square baking dish (either an 8x8 or 9x9 will work fine). Whisk together your mashed bananas and eggs. Stir in yogurt, milk, cinnamon, baking soda, nutmeg, salt and vanilla. Stir until combined. Stir in brown sugar and oatmeal and pour into prepared dish. Bake for 40-45 minutes or until completely set. I love this! I love oatmeal and I'm always looking for healthier ways to enjoy it. I'll have to try all of them now! Happy Sunday! I know I am biased, but I think they are great! I try not to use too much sweetener to keep them healthy and wholesome. I hope you enjoy them! Thanks! I adore oatmeal recipes! They are so wholesome! Baked oatmeal is a fabulous Saturday morning, post work out breakfast! Yes, it would be perfect for that! Of course! Baked oatmeal is a natural breakfast, yet it never occurred to me. We bake oatmeal in cookies and in crisps, but this is a great idea. Will put it on my list for sure. Thanks for the inspiration. What a nice make-ahead breakfast idea! I love how easy it is and how great it reheats even a few days later! Thanks! Oatmeal just makes everything better :) Thanks for sharing. It is one of those foods that makes things better, isn't it?! Thanks! You know I keep meaning to try baked oatmeal but haven't quite got round to it yet. This sounds a great flavor. You definitely have too! There are some really dense baked oatmeal recipes out there, but I like mine a little fluffier. This is solid enough to hold a piece with your hand, but isn't really heavy and dense! You can mix it up and bake it while you are getting ready for the day... or make it ahead and breakfast is ready when you are! I hope you give it a try! 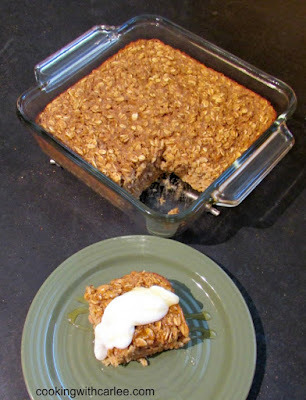 I love baked oatmeal and I'm always trying to find way to use up bananas...win-win! This sounds so good and what a nice tradition your brother has started. Isn't that fun? Thank you! I love baked oatmeal and made a banana bread inspired one not too long ago. So tasty! I love playing with different flavors, so much fun! I love baked oatmeal. This recipe looks so good. 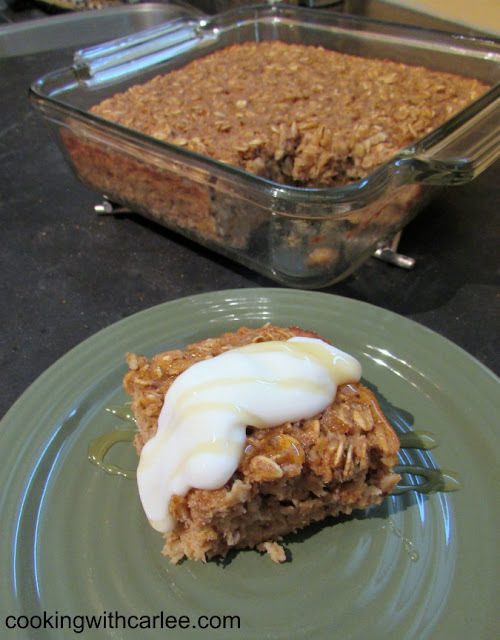 love baked oats, this variation is decadent! This looks so good! I have to try and make this!! thanks! What a lovely story! 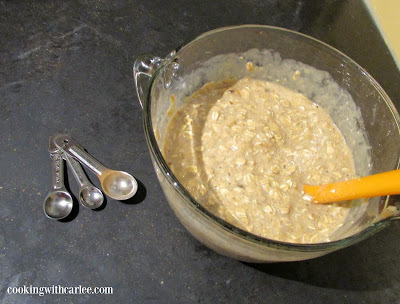 I have made overnight oats but never baked them...I will be trying this soon! I hope you enjoy them! I loved what was essentially an overnight oatmeal recipe when I was a kid. I think it was from a Care Bear cookbook. I haven't made any in a while though. I definitely need to make some soon! You definitely picked the perfect recipe for Mom's favorite recipes. Keep these baked oatmeal recipes coming please. I made that pumpkin pie one recently and we all went back for seconds. (Someone even had a third helping). I hadn't thought to top it with a little yogurt and honey or maple syrup. Yum. All of these baked oatmeal recipes would be so good topped with a few roasted pecans too. Enough said. =) The pumpkin definitely ranks up there! Have you made the cocoa one yet? I don't think so, but I will soon. Do you think I might like it too much? It might be hard to stop at one serving. Ew! No wonder he didn't like it! It definitely needs some fruit or sugar or cinnamon or SOMETHING!!! I hope he like it! I love banana bread and I love oatmeal, what a winner! I've already printed this off and pinned. Yum! This sounds delicious! I love oatmeal for breakfast, but I have never had baked oatmeal before. Oh my goodness, you have to give it a try! This sounds delicious! Pinned. Thank you for sharing at Merry Monday! I have never tried baked oatmeal. Never even knew it was a thing! You are sure schooling me on new and different recipes to try, I love that. I know that oatmeal is good for me, I'm just not a fan of the type in a bowl with milk. Something about the consistency. This looks right up my alley, perfect! I think you'll love baked oatmeal! It is a great way to get more of a muffin texture, but without the flour which I know is up your alley! Hi Carlee, this would be perfect for using up my bananas and I have everything needed. Thank you. Ooooooh, yay! I hope you enjoy it! Hi Carlee, I've just made a batch of this oat bake and I'm not sure it's going to last until Monday morning. It was the perfect way to use up over ripe banana.